Efficient and sustainable synthesis of MOFs, as nano or microcrystalline powder, is crucial for the development of new applications for these compounds. 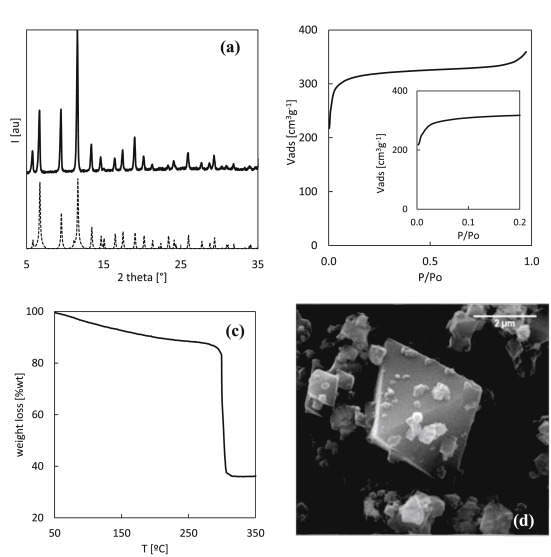 For this purpose, the synthesis of Zn2+, Cu2+ and Fe3+-based MOFs was attempted in this study by using a binary medium consisting of supercritical CO2 mixed with an ionic liquid (emimBF4 or emimBr). In comparison with conventional solvothermal and ionothermal synthesis, MOFs were herein obtained under mild reaction conditions, i.e. 200 bar and 65 °C, after relatively short reaction periods (<10 h). To explore the described synthesis method as a generic procedure for the preparation of three-dimensional MOFs, different linkers of the imidazole and carboxylic acid families were tested. Widely investigated MOFs, such as ZIF-8 and HKUST-1, were prepared along with the complex mesoporous MIL-100(Fe). The structure and composition of the synthesized materials were determined by X-ray powder diffraction and elemental analysis. N2 adsorption at low temperature was used to assess the textural properties.